here i am sharing information about yoga poses for strong wrists. Create space and strengthen overworked wrists with sequences and poses designed to combat wrist pain. The wrist is a relatively small joint and consists of soft and sensitive tissues, ligaments and tendons. The area where the palm meets the wrist has a small indentation and the median nerve. Under consistent pressure, the nerve may get strained, and you will face wrist pain. If not treated in time, the pain will spread to the forearm. Modern medications can help you to reduce the wrist pain but not for the permanent period. If you incorporate quick yoga workout in your daily life routine, that will bring a lot of benefits. The health of the wrist majorly depends on strength and tone of the wrist and forearms muscle and how much of weight the hands and wrists bear. Taking care of the wrist is more important. You will need a strong grip to hold heavy objects. If you are looking for ways to enhance your wrist power, then the best way is practice yoga for strong wrists. All you need to give some attention to the wrist's strength, flexibility, and alignment to develop a healthy wrist. Apart from all these, with a healthy and strong wrist, you can also do some advanced yoga poses. 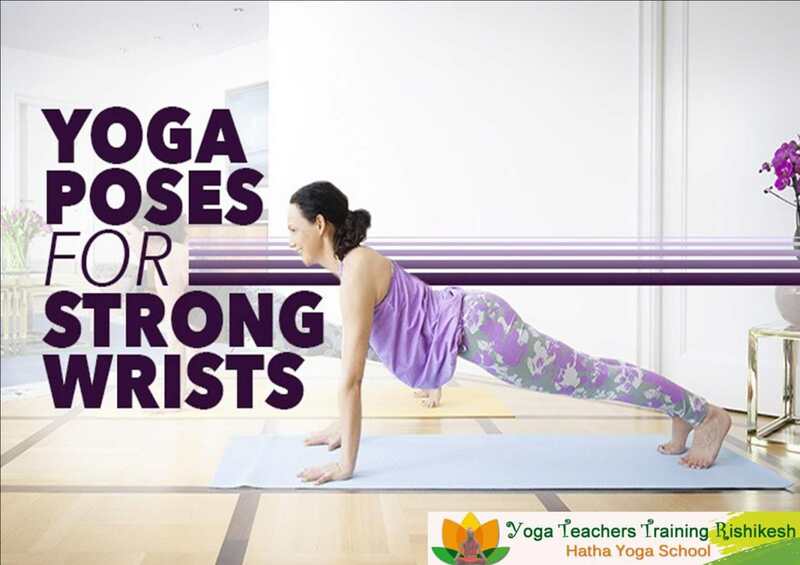 It is mostly practised in hatha yoga class and one of the most integral parts of different vinyasa sequences. It invigorates up the body starting from the hips to the spine, including toes and fingers. You will feel more vibrant and relaxed. Make sure that, your shoulder are piled over the wrists and hips perfectly stacked over the knees. Now tuck your toes and push your hips upward and form an A shape. If you practice this pose with the fingers spread wide, the whole weight will be distributed through the hands. However, before practising this, make sure that you have checked your body weight. This yoga pose not only strengthens the wrist but also bring strength to the arms and spine. While doing keep an eye on the body alignment and engagement. First, lay flat on the stomach. Then place the palm alongside the ribs. Next, straighten the arms and press the top of the feet and lift the torso and front of the body. It will feel like a soft backbend in the spine. While doing this remember to employ the scapula to move the shoulder up and down with alignment. This pose is a little advance, but it can be done with practice. It strengthens the wrist and also helps eliminate harmful toxins from spleen and liver. First, kneel on the yoga mat. Now join the two arms together and rest them on the floor palms facing the toes. Then bring the stomach toward the conjoined elbows. Next, you need to support the body on the elbows and raise the legs. If you have health issues like osteoporosis and arthritis, then avoid this yoga pose. It requires balancing on your arms, and it tones the abdominal muscles, strengthens the arms, shoulders, and the wrists. It does not involve any specific patterns of inhaling or exhaling. Bring the wrists under the shoulders. Make sure that the body is in a straight position. Next, tuck the toes; take a step back with the feet so that the body and the head form a straight line. Bring the pelvic muscles inward to your spine, and at the same time, contract the abdominal muscles. It is treated as one of the best yoga stretches to get stronger wrists. Begin this with plank yoga pose. Next, bring the feet to touch and then roll onto the outside of the left foot, aligning the feet, hips, shoulders and the wrists. Then, use left hand's fingers and press the base into the mat. Gently balance the weight in the left-hand between the pinky finger and thumb. Use the thighs for stability. These are some best yoga exercises that you can practice daily to make the wrist and arm stronger. So that you can lift more weight and will not feel pain in the wrist muscle. Take help of morning yoga routine video to practice these poses at your home. How has practicing yoga changed your life?